Extreme weather already has a significant impact on aquaculture production. This project aims to assist fish farmers in five Mekong countries better manage climate-related risks, and thus capacities to adapt to climate change, through jointly evaluating and supporting the development or uptake of promising innovations. Innovations are novel practices or new applications of knowledge. While usually they are thought of as technologies, such as a pond aerator powered by wind, for example, they may also be institutions, as in weather index-based insurance, or information-communication systems. In this project Innovation Facilitators will work closely with farmers throughout the project to develop solutions to climate risk management challenges that are appropriate to local conditions and fish culture systems. This will involve deliberative communication with relevant stakeholders, undertaking interdisciplinary research, and coordinating efforts by Solution Teams to overcome performance limitations and barriers to adoption. The expected outcome is that fish farmers are better able to manage climate-related risks and adapt to climate change. Aquaculture in the Mekong countries of Cambodia, Lao PDR, Myanmar, Thailand, and Vietnam is an important economic sector, source of livelihood, and contributor to the resilience of food system. Myanmar, Thailand and Vietnam ranked among the top 10 aquaculture producers globally in 2012. In terms of global value chains, Thailand and Vietnam were the 3rd and 4th largest exporters of fish and fishery products valued at 8.1 and 6.3 billion USD, respectively, in 2012. In the case of Thailand, total production has remained high despite significant declines in catches, as the contribution of aquaculture to total fisheries production compensated for the drop; rising from less than 20% in 2000 to over 41% in 2010. In 2015, aquaculture contributed about 20% of total fisheries production of Cambodia, and the plan is to increase this by 15% per year. Vietnam’s master plan for the fisheries sector, for instance, sets targets for overall growth in production and increasing contributions from aquaculture to 65% by 2020 and 70% by 2030. Thailand’s plan sets a target of increasing production by at least 2% annually. In Myanmar, the government recognizes the need for expanding small-scale and commercial aquaculture. In all countries risks of disease and poor water quality increasingly exacerbate the challenges of increasing aquaculture production. Extreme weather events and climate changes are emerging as another set of factors critical to the future of aquaculture sectors. Floods and spates can have significant impacts, as they lead to fish escapes from ponds, damage cages, and exhaust fish trying to maintain their position in the current. Droughts or low flow volumes often lead to lower water quality, as wastes from fish farms and other users are concentrated, and there is no or little water exchange. Geographic differences in climate such as mean temperatures, hours of sunlight, and risks of heat waves or cold spells are also important to performance of hatcheries and fish farms, as these conditions influence fish reproduction, feeding, growth and survival. Risks of disease vary with seasons and among locations with different climates, and increase with stress arising from rapid changes in temperature and water conditions. In coastal regions, cyclones, storm surges, and salinity intrusion can damage farms or disrupt production. Despite uncertainty over the range of change in climate factors such as rainfall, most studies agree that the Mekong Region will be warmer, and that extreme events such as floods and droughts will become more frequent or severe, and that sea-levels will rise. The key policy problem is thus: how to improve the capacity of aquaculture to adapt to a changing and often more challenging climate, across a region expecting larger contributions from aquaculture, as well as greater water demands from multiple sectors in the future. Government policies on water, trade, and investment are all likely to be important, alongside more sector specific strategies to promote and regulate aquaculture development, as well as better manage wild capture fisheries. Inputs from research are essential too, for instance, with respect to strain improvement, nutrition, disease screening, and treatment. But ultimately, how the private sector responds to these resource and regulatory challenges, as well as market opportunities, will be crucial. This is because a key part of the solution to the policy problem lies in sustained and sustainable innovations; sustained because the challenges are not going to disappear but will change; sustainable because actions taken to adapt to climate change should not increase negative impacts on water quality, ecosystems, or human health. In general, the role of the private sector and value chains in adaptation to climate change has not received the level of attention it deserves. A key research problem is therefore to understand how innovations that are important to adaptation rise to become a dominant practice, as well as why others fail to do so. Past work and theories of innovation provide a starting point for asking more specific questions. 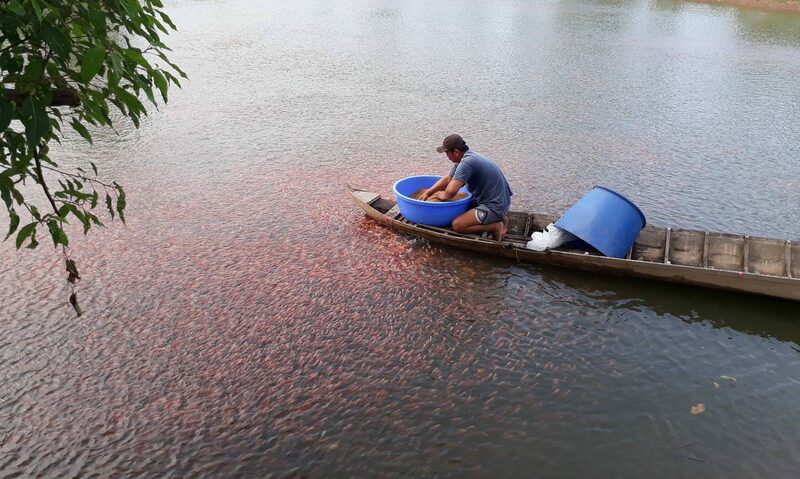 The findings of the IDRC-supported AQUADAPT project on fish farming in Northern Thailand, for instance, suggests that a combination of technological, informational, and institutional innovations have been important to improving the management of climate-related risks. These included, for example, technical innovations such as reinforced cages that would not be deformed in fast flows, and the use of extra ponds to store water from wet season to help deal with risks of shortages in a prolonged dry season. Fish farmers also made use of mobile-phone applications to share information about rapidly changing water conditions with a larger group of farmers downstream or in their irrigation area. Options for establishing new insurance schemes were explored with firms and officials, and the conditions which needed to be met identified. Other entrepreneurial farmers were exploring ways to add-value to fish products that are harvested early because of imminent extreme weather events. Many of these local innovations appear to be useful to fish farmers in other locations and countries with modest efforts at dissemination and adjustment to contexts. To what extent and under what conditions are innovations useful to managing climate-related risks transferable among locations and rearing systems? Where useful technologies already exist and are available, they may still not be adopted for a variety of reasons, including lack of reliable information, concerns with costs and reliability, skewed incentives, or constraints on use arising from existing laws and regulations. Individual differences in risk perceptions and preferences, as well as beliefs about the efficacy of alternative practices, are also known to influence rates of adoption of practices. In these situations, innovation may be needed in how communication itself is done and influences uptake. How do gender, culture, and social norms influence access to, and use of, aquaculture technologies and innovations? System innovation theories highlight the role of socio-technical regimes (which can be thought of as the institutions and actor networks which develop around a core technology) in filtering out innovations that do not fit the existing value-chains, rules, norms and relationships. Such regimes are often barriers to innovation. One example is the early intensification of native black tiger shrimp in Thailand around small-scale hatcheries using wild-caught females; a practice that dominated the industry despite serious problems with disease outbreaks. It was not until legal adjustments were made that the exotic Pacific White Shrimp could be introduced alongside innovations for specific-pathogen-free procedures in hatcheries. A rapid shift in species reared and re-organization of the industry followed. Theoretical arguments and empirical evidence in diverse fields suggest that sustainability experiments are an important source of innovations that challenge and potentially reshape socio-technical regimes. A common feature of successful experiments is that they operate, at least temporarily, in a safe space or niche. Safe spaces may be created by government policies or firms as part of investments in research-and-development; they may also arise out of cultural preferences, for example, related to eating locally produced or organic food. In the case of aquaculture, it is not clear to what extent global knowledge flows are driving changes within each of the countries in the region, and thus: How relevant are national policy environments and local entrepreneurship to innovation, as opposed to technology diffusion, for successful adaptation? The project will contribute in creative ways to the IDRC strategic goals of producing innovative solutions at scale, building leadership and fostering partnership. To scale-up research outcomes from a sub-national level (AQUADAPT-Thailand) to a regional scale (AQUADAPT-Mekong), the team intends to engage with commercial producers and other actors throughout the value-chain as the ‘agents of change’. This will build on existing international linkages established in AQUADAPT-Thailand, but also expand these through facilitated exchanges of practitioners in the aquaculture sector at a national and regional level, including: feed and supplement input suppliers; private hatcheries; equipment manufacturers; logistics companies, traders, processors, retailers and exporters; and, insurance companies. The project will build leadership within the Mekong Region countries in relation to management of climate-related risks and adaptation to climate change on three different ‘levels’: (1) Identifying and elevating the profile of farmer-educators / champions of change in the target research areas in each country. These are anticipated to be the first-adopters of new innovations and technologies intended to help improve the management of climate-related risks; (2) Funding and capacity building of the Research Fellows and Innovation Facilitators through direct ‘training’ and by exposure to and advice from the senior members of the Stakeholder Advisory Group, Solution Team Experts, Nodal Partner Leaders and the Project Leader; and, (3) Providing a Climate Focused platform for the members of the Stakeholder Advisory Group and the possibility to participate in international forums to form links and promote collaboration among the countries within the region as well as beyond. Partnerships built between fish farmers, value-chain actors, other private firms, government officials, community leaders, and researchers around innovation in the aquaculture sector and its contribution to adaptation to climate change. This exchange will influence the policy environment. Cross- and within-country partnerships will be specifically built in three thematic areas: (1) among software developers, fisheries officials and producers in the development and support of new mobile-phone based applications to help communicate climate related risks and share good risk management practices; (2) among manufacturers, officials and community leaders in the trialling of improved and inexpensive aeration and water quality monitoring technologies; and, (3) among business management service providers, officials, value-chain actors, and community leaders in the design and piloting of risk sharing tools such as weather-indexed insurance. Improve the capacity of fish farmers in the Mekong Region to manage climate-related risks and adapt to climate change through innovations that contribute to the sustainability of aquaculture value-chains. Prioritize needs for innovation in management of climate-related risks and adaptation to climate change in the aquaculture sector in the target locations in the Mekong countries. Identify, refine, and enhance uptake of sustainable innovations with high potential to improve capacities to manage climate-related risks and adapt to climate change in the target locations. Distill and share lessons learnt regarding innovation for adaptation in the aquaculture sector with relevant private and public stakeholders. Closely coordinate activities with project partners in different countries so that objectives 1 thru 3 are efficiently achieved. By fish farmers we include producers of shrimp, crabs, molluscs, and other aquatic organisms in inland or coastal areas. By Mekong Region we include all the territory of the countries of Vietnam, Thailand, Lao PDR, Cambodia, and Myanmar (Figure 1). By innovation we mean novel practices or new applications of existing knowledge. By sustainable we mean reducing negative impacts on human health, water quality, and ecosystems; while at the same time generating livelihood or employment opportunities for women and men. The project’s objective to enhance capacities to manage climate-related risks through sustainable innovations support national priorities for aquaculture in three ways. First, as noted above all countries have policies to increase aquaculture production. Extreme events, including major cyclones in coastal areas, are recognized as a challenge to achieving targets. Second, all countries underline the importance of knowledge, either as research for development, farmer training, or capacity building for extension agents. The Thai Master Plan highlights investments in research and transfer of technology as ways to improve sustainability and adapt to climate change. The Lao PDR master plan for the agricultural sector emphasizes the need for research for development in the aquaculture sector, and includes attention to climate change impacts on agriculture more broadly. Vietnam’s aquaculture master plan calls for large increases in proportions of trained fish farmers.39 Building research capacities and working directly with farmers are activities this project will demonstrate in target areas with respect to the management of climate-related risks. This project’s emphasis on innovation as an important component of adaptation will help countries develop longer-term strategies to adapt to changing climates in the aquaculture sector. Third, how national policy impacts the aquaculture sector and other stakeholders in particular places is important for long-term sustainability. The views of non-state actors in the region regarding national priorities for aquaculture development are less uniform than that of governments. Consumers of shrimp and fish, local communities and non-governmental organizations have often expressed concerned about unsustainable aquaculture practices that have destroyed mangroves or polluted waterways or produced food unsafe to eat. Negative media coverage of the sector has amplified negative perceptions internationally and domestically. At the same time, the social development benefits of aquaculture are unevenly recognized at community and sub-national government levels. The emphasis in this project on multi-stakeholder engagement, joint evaluation of alternative technologies and communication will help build relationships and capacities needed to foster sustainable innovations. This proposal developed out of discussions with IDRC over the last year including a visit to Ottawa to present findings of the previous project in Northern Thailand, and to highlight the likely importance of on-going innovation for climate change adaptation in the aquaculture sector. In December 2016 a workshop was held in Chiang Mai, Thailand with participants from the five countries to discuss and refine an earlier draft of this proposal. The project interventions will be organized around a set of innovation cases that are purposively chosen to cover three basic types: information-communication, technical, and institutional-organizational. Within these types the innovation thematic areas identified as most promising from previous work in Northern Thailand, and discussions at a workshop with representatives from the five countries, were: mobile phone friendly, web-based, applications for communicating risks and management practices; aeration and water quality monitoring technologies; and, business models to share risks like weather-indexed insurance. The specific innovations to be fostered will be decided through iterative co-design process with stakeholders, especially fish farmers, but also with inputs from other relevant stakeholders such as consumers, value-chain actors and government officials. The work needed to ultimately enhance uptake of useful innovations will likely vary among innovation areas and countries. In some cases, the focus will be on overcoming barriers to uptake of innovative technologies already in use, through those requiring refinement to suit local conditions, to novel research and development efforts. The targeted research components of this project will draw on a wide-range of interdisciplinary methods. Quantitative observational, experimental, modelling and survey work will be needed at various steps to help understand relevant climate-related risks and existing practices as well as evaluate potential and performance of alternative technologies and practices. Qualitative research methods including participatory observation, narratives, in-depth interviews, and group discussions will also be needed, for instance to study policy and other barriers to innovation. Analyses will be disaggregated by Gender, an important analytical and practices dimension of this project. Gender is referenced in the definition of sustainable innovation, key research questions, research outputs, design of key events, project team membership, and outcomes indicators. The aim is to ensure that project interventions lead to innovations that are accessible to and benefit both women and men. The study or target locations in each country were chosen because aquaculture activities are already significant and known to include farms affected by extreme weather events or climate conditions (Figure 1). The geographical scale of the target locations is large enough to contain at least 1000 households engaged in aquaculture and provide some variation in level of climate-related risks. In Thailand and Vietnam, for instance, the plan is to include case studies in both coastal and more inland areas with different climate risk profiles. In Cambodia, the proposal is to work in 6 provinces: Kratie and Kampong Cham provinces in the Upper Mekong; Takeo and Kandal/Preveng in Lower Mekong; and Siem Reap and Kampong Chhnang in the Great Lake Tonle Sap area.